So last week I was experimenting with making a flourless pizza crust. 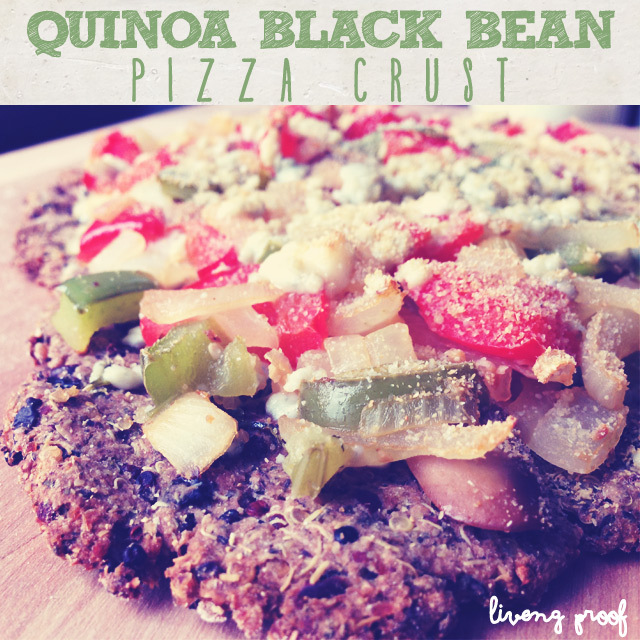 I decided quinoa would make a better base for pizza “dough” (after my failed attempt at cauliflower pizza crust). I was so surprised with the results! It came out perfectly. I’m so glad I wrote down what I was throwing into my mix, and in what proportions. I hope you are just as please with the result. Bon appétit! Add the ground flaxseed, minced garlic, italian seasoning, and baking powder. Mix well. I used what I had on hand for the toppings but you can do whatever you want! For this pizza I sautéd onion, mushrooms, green and red bell peppers. I sprinkled one half with gorgonzola (for me) and half with parmesan (for my guy). Once you’ve added your toppings, bake again at 400 F for 8 – 10 mins. Hey! This sounds awesome 🙂 Just a question; is the 1 C Quinoa in your recipe pre-cooked before being mixed with the beans? Thanks! Yes! Use cooked quinoa -I apologize for not specifying! You don’t need a binder for this? Also was the quinoa cooked? Yes, cook the quinoa as you normally would! The ingredients bound as they are listed! Try it, you’ll be surprised ?